These normally take place on the fourth Monday of the month, from 7.15pm, at Colville School, Lonsdale Road, W11 2DF. Entrance via the playground, turn right. Please arrive early to help set up, and/or stay to tidy away chairs afterwards. We often go to ‘Finches’ on Portobello Road after the meeting, all welcome. The next Kensington Labour meeting is taking place on Tuesday 29th March at 7:30pm in Colville Primary School, Lonsdale Road, W11 2DF. The next Kensington Labour Party meeting is taking place this Monday, 22nd February, at 7:30pm in Colville Primary School Hall, Lonsdale Road, W11 2DF (the section in between Colville Rd and Portobello Rd). 08 Presentation by Cllr Robert Atkinson, Leader of K&C Labour Group. Kensington Labour Party recognises that Jeremy Corbyn was elected by an overwhelming majority of Labour members and supporters. We expect every MP and Local Councillor to refrain from any public attacks or activity which seeks to undermine the choice of party members and seek to weaken the position of Jeremy Corbyn. We welcome policy discussion which is essential to a democratic Party, but we believe all Party members and especially elected officials must focus on the very effective fight against the Tories which has already seen them defeated on tax credits. We urge all Labour MPs, Local Councillors and all those taking the Labour Party Whip to do everything possible to fight the Tories, not our democratically elected Leader. Kensington Labour Party wishes to record its solidarity with the people of Paris in the wake of the horrific attacks on places of entertainment and leisure on the night of November 13, 2015. There is no excuse for these atrocities. However, it appears that the attacks were in retaliation for the French bombings of Syria. We believe that acts of war will not resolve the situation that is driving hundreds of thousands to flee from their homes and risk their lives to reach safety. We therefore call on Labour leader Jeremy Corbyn to continue to resist attempts to engage in bombing Syria and to pursue peace initiatives through the United Nations and other diplomatic channels. We will be using Alternative Vote (AV) to shortlist one of these candidates. Candidates will have to be proposed and seconded at the meeting. The Constituency Labour Parties of all parliamentary constituencies within the West Central GLA seat can shortlist one candidate each. Each candidate who is shortlisted will be placed on a ballot which all members within West Central will be posted later in the year and will vote on to choose the one official Labour candidate who will fight the seat in 2016. All members are welcome at this meeting; there will be other stuff happening which everyone can take part in but only those who joined before 1st March can vote to shortlist our GLA candidate. The meeting will take place on Wednesday 9th September at 7:30pm in St.George’s, Aubrey Walk, W8 7JG. 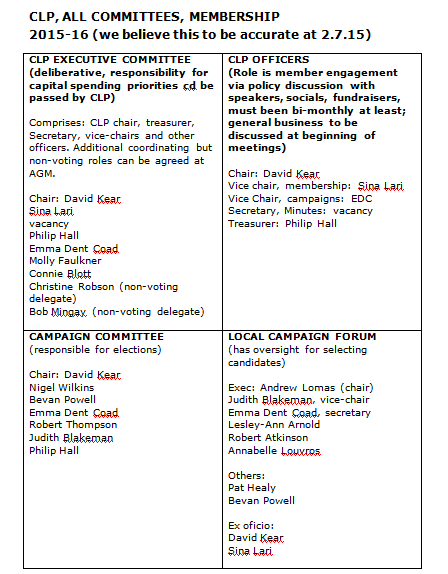 After our Executive Committee meeting on 25th June we thought it might be helpful for members to know who sits on which committee – we think this is correct as of that date. This meeting is the first All Members Meeting after the General Election so please make every effort to attend. We would also like to warmly welcome all new members who have joined recently. This meeting will offer an opportunity for members to engage in discussion about the election and the future direction of the party. In addition, we will be nominating candidates for Mayor and the National Policy Forum. Murad is a London-wide Assembly Member with shadow constituencies in West Central & South West London. He is Deputy Chair of the Environment Committee and Chair of the London Waterways Commission. He also sits on the Economy, Health and Transport committees. In addition, we may nominate one Youth member to the NPF. Meetings are usually help on the first Tuesday of the month from 7.30pm; all members will receive notification by email beforehand. Currently we are meeting at St George’s, Aubrey Place, off Campden Hill Road W8. There will be no meetings until after the election in May.